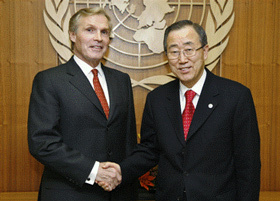 Today the UN Secretary-General has appointed Ray Chambers as his first Special Envoy for Financing of the Health Related Millennium Development Goals (MDGs) and has renewed Mr. Chambers’ mandate on malaria. In this expanded role, Mr. Chambers will promote increased investment by the public and private sectors to reduce child and maternal mortality, HIV/AIDS, malaria, tuberculosis and other diseases by 31 December 2015, the internationally agreed deadline for achieving the MDGs. Since his appointment as Special Envoy for Malaria in February 2008, visibility, awareness, and funding for malaria have each increased exponentially, with over $4 billion raised, over 400 million mosquito nets distributed and millions of treatment courses administered. Yet difficulties in bringing malaria deaths down to near-zero by the end of 2015 highlight a broader challenge: ensuring the availability of financial resources. The Secretary-General’s appointment of Mr. Chambers to this expanded role seeks to catalyze new efforts in this regard. “This new post is essential for financing of the urgent global health targets reflected in the MDGs, and Ray Chambers is the ideal person to lead it,” said Gary Cohen, CEO of the MDG Health Alliance and Acting CEO of GBCHealth. Mr. Chambers, a philanthropist, is the founding Chairman of the Points of Light Foundation; co-founder, with Former Secretary of State Colin Powell, of America’s Promise — The Alliance for Youth; and co-founder of Malaria No More. He has served as one of the Secretary-General’s MDG Advocates since 2010. In 2012, Mr. Chambers founded the MDG Health Alliance and most recently, in January, Mr. Chambers joined the Board of Directors of GBCHealth as Co-Chair. He previously served as Chairman of The Millennium Promise Alliance and as Chairman of Wesray Capital Corporation, which he co-founded with Mr. William E. Simon.